No website about emergency preparedness would be complete without a page on first aid kits. After all, isn’t basic first aid some of the things we’ve all had drilled into us since we were children? We’ve all experienced the scrapes and boo boos that made the adults run to the household first aid kit for the antiseptic salve and an adhesive bandage (probably with a cartoon character on it if you’re younger than I am). It’s the one thing almost every household has. But, when you live in an area that sees wild fires, heavy storms or other harsh weather, you need to look at the homely first aid kit just a little bit differently. On this site, we are concerned with being ready to face a natural disaster whether we are sheltering in place or evacuating. Either way, our go bag must include enough emergency supplies to last several days – sometimes weeks. Most authoritative sites such as the Red Cross talk about what to include in a first aid kit. As a person who travels seasonally, I have a standard checklist of what I keep in my kit. It may – and most likely will differ from yours because you and I have different needs. If you take prescription medications, obviously you want to be sure you have them in your first aid kit. Also, if you have severe allergies, you will want to be certain you bring the appropriate treatment for an attack (e.g. epinephrine for a bad allergic reaction, or whatever your health care provider has prescribed). During a time of stress when you are trying to ready yourself to evacuate a situation, you might not remember that you need that epinephrine. So, be sure this type of medication is already in place in the kit. As I mentioned elsewhere on this site, I keep a spare pair of eyeglasses in my kit, because I will be in a serious bind if something happens to my day to day pair. I might not be thinking of it if I’m in a hurry to get out, but if the glasses are already in the container with my other supplies, I’m all set. One thing that the Mayo Clinic suggested that I had not considered but feel is really important is to include your family’s medical history and medical consent forms. You should have one prepared for everyone in your family. Also, be sure to have all the pertinent phone numbers and other contact info for your doctors and all the emergency services in your area. Now, you can buy a few ready-made kits as well. If you don’t have specific needs that might necessitate customization, you might be fine with one of the following that I found. Any of these look pretty good to me. I like the gear that they have at sites like SurvivalFrog.com and DayOneGear.com. Survival Frog has a bunch that are in stock. Their selection is quite extensive. They even have a Dog Emergency Kit (only about $40)! How many people think about Fido when prepping? This kit contains Drinking Water Pouches, 2 Emergency Pet Food Rations (for dogs), folding bowls, a mylar blanket (which you should have for yourself too! ), lightstick, whistle, can opener, nylon rope, a dog collar, chain leash, tennis ball, “poop” bags (definitely need those!). What I would do if I had a pet would be to include some pet meds as well. Talk to you vet about what you might need for your own dog or other pet! 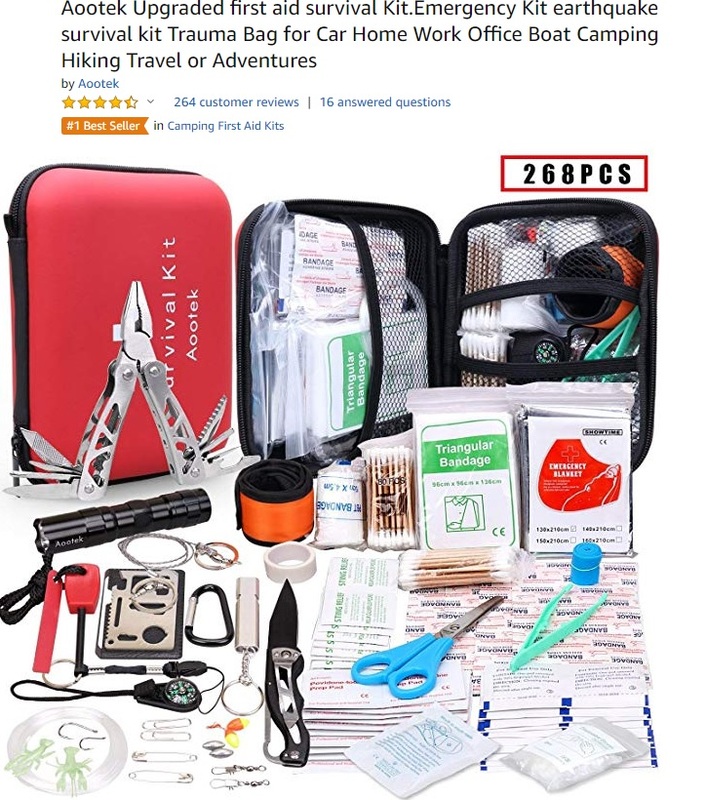 I also like their Medical Kit “Pro” Ultralight/Watertight first aid kit (about $125) that was initially designed for mountaineering and has been used by Yosemite Mountain Guides. Aside from the basic gear you would expect in any kit, it also has a CPR mask, irrigation syringe to effectively cleans wounds (along with wound closure strips), different splints and bandages, first aid guide (good to have no matter how prepared or trained you may be), tick removal forceps (ticks are so gross), and more. Check out the image I took here so you can see how extensive it is. On the Survival Frog site, it shows the kit being held by one finger, to indicate how lightweight it is (the site doesn’t give me a total weight). Actually, Survival Frog has so many kits, it’s hard to describe them all. We’ll just direct you to their page because you are going to be pretty impressed with their site. 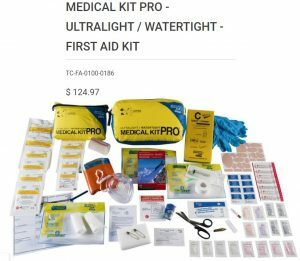 Then, over at DayOneGear, there aren’t as many kits in stock as of this writing, but they do have a number of them, such as the basic 107 Piece First Aid Kit that runs about $50 or so, and which contains adhesive bandages, splints, gauze, cold pack, and the simple things you would expect. Over at Amazon, the Aootek Emergency Kit is far more than a basic first aid set up. This is pretty extensive (with about 268 pieces). It also gets excellent reviews – at this writing there are about 260+ reviews averaging about 4.5 stars. It’s the #1 best selling kit on Amazon. I’ve included a photo of it here so you can see everything they have in it! The point is, no matter how basic it may be, you need a first aid kit. I don’t care if it’s in a pre-made container, of you make it yourself. Please don’t delay in setting one up. If there was one thing other than extra water, food supplies, heat and lighting that you might need during an emergency, it would likely be this.